A new Stride form of Susanoo that refills your hand appears on the first day of the New Year! Cont (VC) GB2 Oracle: This Unit gains Power+5000 / Critical+1. Auto GB2: [Counter Blast 2] When this Unit is placed on (VC), if there are 4 or less cards in your hand, you can pay the cost. If you do, draw until there are 5 cards in your hand. Happy New Year, Everyone!! Please remember “Cardfight!! Vanguard” and “Today’s Card” this year as well. And, to commerate 2017, for “Today’s Card” we’re introducing from the Character Booster “We Are!!! 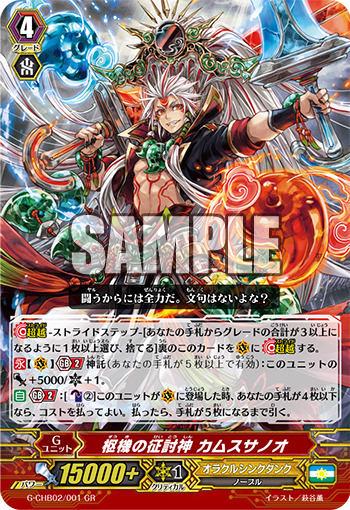 Trinity Dragon” (on sale January 13th, 2016): The 《Oracle Think Tank》 【Oracle】 Deck’s trump card “State Affair Subjugation Deity, Kamususanoo”! “State Affair Subjugation Deity, Kamususanoo” is a G Unit with a marbvelous ability based on 《Oracle Think Tank》’s 【Oracle】 (i.e. an effect that is active when your hand has 5 or more cards). When it enters the field, you can pay 2 Counter Blasts to draw until there are 5 cards in your hand! So if you use up your hand in the previous turn with Guarding, you’ll be able to recover your hand in the blink of an eye. If you Stride it on top of “Spiritual Sword of Rough Deity, Susanoo”, you can use its Stride Skill to draw 1 card, meaning you’ll have a total of 6 cards in your hand! And once you’ve achieved 【Oracle】, it’ll have a Power+5000 and Critical+1. Since its Critical also increases, you’ll be able to apply incredible pressure to your opponent. The Character Booster “We Are!!! Trinity Dragon” contains many cards that supports 《Oracle Think Tank》’s 【Oracle】. So look forward to further information! The next update for “Today’s Card” will be January 4th, 2017! Look forward to it! Q. My hand is currently 2 cards, for the GB2 Oracle effect of “State Affair Subjugation Deity, Kamususanoo” that grants Power+5000/Critical+1, if my hand check becomes 5 after I Drive Check, do they apply during this battle? Q. Yes, it applies. The Power & Critical increasing effect of “State Affair Subjugation Deity, Kamususanoo” is a Continuous ability, meaning it works when it can be applied. Even if the conditions aren’t fulfilled when you declare an attack, if your hand becomes 5 by the time you Damage Check, it applies. ※ Today’s Card will not update during January 2nd and 3rd, 2017.